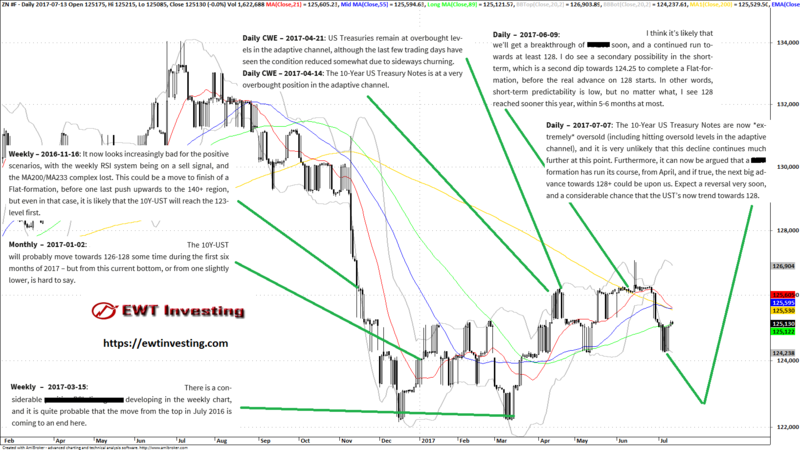 As usual, we’ve prepared a summary chart with the relevant technical analysis comments spliced in. Some of them are partially redacted for brevity, and as usual, we’ve only included technical analysis commentary that brought something new to the table, some “maintenance” updates which offered nothing new in terms of technical outlook and analysis conclusions have been left out. Please click the chart below to open a full-size version for your perusal. In November 2016, post the election of Donald Trump, the US Treasuries sold off fairly violently, triggering sell signals in many technical systems. As the 126-level was hit, our composite technical analysis suggested that the 10-Year US Treasury Notes would hit at least the 123-level before bottoming out – which came true just a few week’s later in December 2016, when the 10Y-UST’s traded all the way down to a 122-handle. In early 2017, on the 2nd of January to be exact, predictability was reduced in the short term for the 10Y-UST’s, but nonetheless, our analysis at the time called for the 126-128 range to be regained during the first six months of 2017, which came true in June 2017, as the 10Y-UST’s traded up all the way to 127. The markets can often be hard to accurately forecast in the short-term, but provide a greater confidence pattern in the medium-to-long term, and this was one such occasion. On the 15th of March 2017, predictability increased considerably in the 10Y-UST’s, and we issued a call for the current declining formation from 2016, to finally come to an end. In hindsight, this was correct, and the UST’s reversed higher. In mid-April 2017, our technical systems signaled that an overbought condition had arisen in the 10Y-UST’s, after a strong rise from mid-March. But, at the time we didn’t expect anything else than a minor correction, so it’d be unfair to claim that we called the entire subsequent decline back to a 124-handle in mid-May. Also, the bottom in mid-May was not something we specifically called out, to our systems predictability was low, and we only had the longer-term forecasts to go by at that time – hence, it’d also be unfair to claim that we called the bottom in mid-May 2017. On the 9th of June 2017, our analysis pointed out a considerable chance that the 10Y-UST’s would advance towards 128, but also that there was an considerable chance that the 10Y-UST’s would first see a drop towards the 124 level. What happened was that the advance reached a 127-handle, but stalled and then the market fulfilled our secondary short-term possibility, declining all the way to a 124-handle in early July. This was yet again a typical example of why it’s really important to be aware of all of the probable scenarios at any given time – armed with our knowledge, an investor would’ve avoided chasing the upside too heavily without proper risk management. Then, on the 7th of July 2017, our technical systems as well as Extended Elliott Wave Theory analysis, signalled a very oversold situation in the 10Y-UST’s, and with a strong structural probability of a reverse in direction. And indeed, that turned out to be the bottom (for that market phase…), with the UST’s bouncing considerably over the next few days. It’s also quite possible that we’ll now see the 10-Year US Treasury Notes trade towards a 128-handle, as we wrote on the 7th of July. The predictability of the 10-Year US Treasury Notes dropped considerably in December 2016, and thusly, short-term analysis was harder to make over the next few months. While not 100% perfect in terms of nailing all short-term swings, and while sometimes pointing out that an ambigious situation had developed, our composite technical analysis using our Extended Elliott Wave Theory still managed to come up with very valuable conclusions at some key points along the way, allowing our clients opportunities to prevent losses, get some very good trade entries, and not be whipsawed out at either overbought or oversold market conditions. If you are trading the 10-Year US Treasuries and want to gain access to our technical analysis, don’t hesitate to sign up today (opens in new tab) and secure a subscription slot, or Contact us (opens in new tab) for more information should you have any questions.